Guitar Lesson 2 is a charming little piece by Matteo Carcassi called Galop. 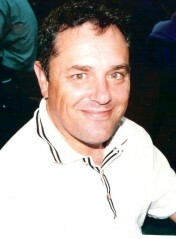 Traditionally, a Galop is a quick dance usually in 2/4 time. It was very popular during the 19th century. It originated in Germany but was also quite popular in France. The reason I've chosen this Galop is so that you may practice some open string or natural harmonics and to practice guitar slurs using the 3rd and 4th or little finger of the right hand. When playing these harmonics (on the 12th and 7th frets) you must make sure that you place your finger on the string over the TOP of the fret, not before it as you play ordinary notes (see more here). When you watch the video of Galop, (see below) you'll notice my left hand third finger moving slightly up and down as I play the harmonic. This is to avoid the ridges of my finger spoiling the effect of the harmonic. I try using the end segment of my finger to facilitate this a little more. This guitar lesson also gives you the chance to practice playing guitar slurs with the 3rd and little (4th) fingers of the left hand. Many guitar players especially avoid using the 4th finger and so it always remains weak. If you have any difficulty playing the slur just practice those few bars over and over again BUT SLOWLY! Many classical and other guitar players tend to rush their practice in order to play the piece quickly, but this is really counter-productive. You need to curb the tendency to play/practice the piece from go-to-whoa every time because this just leads to bad habits and practicing mistakes - more on this topic at another time. Back to slurs. Make sure you "drag" the string downwards with your little finger so that there is a nice clean and crisp "snapping" sound. "This book is suitable for classical guitarists of all levels from beginners through to advanced players. 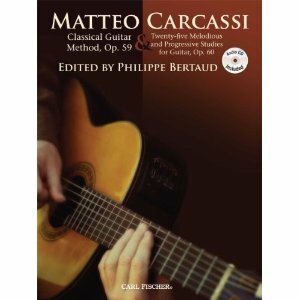 The book contains Carcassi’s “Classical Guitar Method”, Opus 59, which is a great instructional work consisting of three sections: (1) The Rudiments of Music, (2) Scales, Cadences, Exercises and Preludes, and (3) Fifty Exercises Progressing in Difficulty. The 50 exercises are absolute gems as they are musical and melodious and amount to excellent student repertoire. The book also contains Carcassi’s “Twenty-Five Melodious and Progressive Studies for the Guitar”, Opus 60. These studies have become part of the classical guitar repertoire and are commonly played in concert performances. The book comes with an excellent CD in MP3 format of Philippe Bertaud playing the Opus 60 studies."